The Case of Curiosity is a multi-modal teaching tool that emphasizes differentiated learning. Students engage with a variety of objects and achieve learning goals through a number of instructional strategies. · While groups are completing their activity, the teacher is to circulate the classroom and present each group with the assignment, which they will complete in the following class periods. If any extra time is needed, students will have to meet outside of class. After class, the teacher will reflect on what went well, what didn’t go well, and what needs to be revisited to make instructions more clear. The goal of this project is to create a multi-modal tool, which will allow for differentiated learning activities depending on student strength and interest. 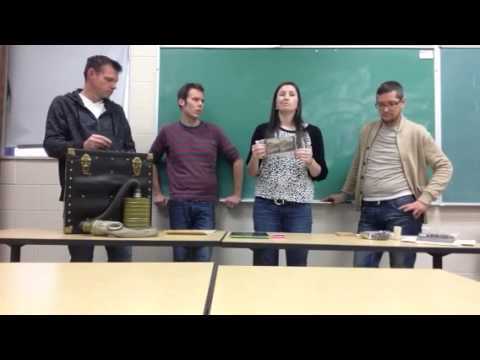 We will present students with a “Case of Curiosity” which will give them an opportunity to explore items inside the case and get to work with historical objects in a tactile manner. Each student will be required to do both an activity and assignment linked to the item they choose from the case. They will be doing both the assignment and the activity in groups. Each item will have an activity that will help guide them to get to know their item and explore it through a series of questions. The second dimension of this is a more in depth assignment that will allow students to demonstrate learning goals in their preferred learning style. There is a letter writing assignment that will require students to research various dimensions of trench life and incorporate historical facts into a creative letter; blending information with creative writing. There is a gas mask item that will require the students to role-play the use of gas masks in a battle scene performed in front of the class or filmed. There is a clay model trench assignment where students will use their artistic talent to create a clay model of the trenches. Finally, there is a photo scavenger hunt that will require students to explore history by engaging with digital technology. The point of these differentiated learning strategies is to give students an opportunity to achieve learning goals in a multi-modal fashion. Hopefully, it will encourage students to explore history in a way that engages them, instead of being forced to follow the teacher’s preference or preferred learning style. The goal is to give student authorial control over their learning. Moving away from what Content Area Reading: Literacy and Learning Across the Curriculum calls “assigning and telling” (Vacca 11). According to this style Content Area Reading states, “You probably had teachers who used an instructional strategy for teaching with text that included the following: Assign a text to read then, in subsequent lessons, tell students what the material they read was about, explaining and elaborating on the idea and information in the text through lecture and question-and-answer-routines” (Vacca 11). The object of our pedagogical tool is to expand what is typically defined as learning, and give students a greater sense of agency over what they do in class, how they achieve learning, and what they produce for marking. It is important to remember that the concept of the Case of Curiosity can be expanded to include other objects from different historical periods or other areas of study entirely. Vacca, Richard, et al. Content Area Reading: Literacy and Learning Across the Curriculum. Boston: Pearson, 2014. Print.